A solar canopy for converting sunlight into energy has taken shape in a town which has already showcased its green credentials to the Prince of Wales. 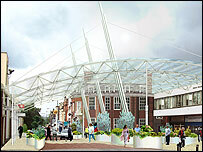 The steel and glass structure was conceived as a "stunning gateway" to the centre of Woking, in Surrey. Construction work is coming to an end, with associated landscaping in the Albion Square area also due to finish. The canopy has 35,000 photovoltaic cells, producing an estimated 51,000 to 58,000kWh of electricity a year. The power will light the canopy as well as being sent to other council sites for use there. Woking Borough Council said it could save the town in excess of 41 tonnes of carbon dioxide emissions each year. The 34m by 22.5m structure (111ft by 74ft) stretches from Albion House over to the entrance to Woking railway station. The High Street was closed to traffic last September while construction work was undertaken, but it is now being reopened. The development also includes a drop-off point and improved disabled access to the railway station. Prince Charles saw the canopy's progress in March during a "green visit" to Woking when he also opened an exhibition encouraging individuals to cut their own carbon emissions.